Book between 20 January and 20 May 2019* and you can secure your stay at the stunning Casa Azure for only $225 USD per night. Split level 3 bedroom, 3 bathroom penthouse with well stocked kitchen, roof top terrace and access to great swimming pool. *special is exluding Semana Santa Holiday which is April 15-28 April). 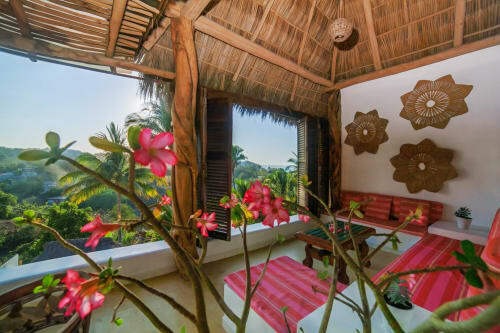 Casa Azure in Sayulita offers the perfect haven for experiencing the Sayulita lifestyle. 190m2 of open concept living space with high ceilings and palm tree jungle rooftop views provide an immediate sense of wellbeing and a perfect backdrop for both relaxing and entertaining. 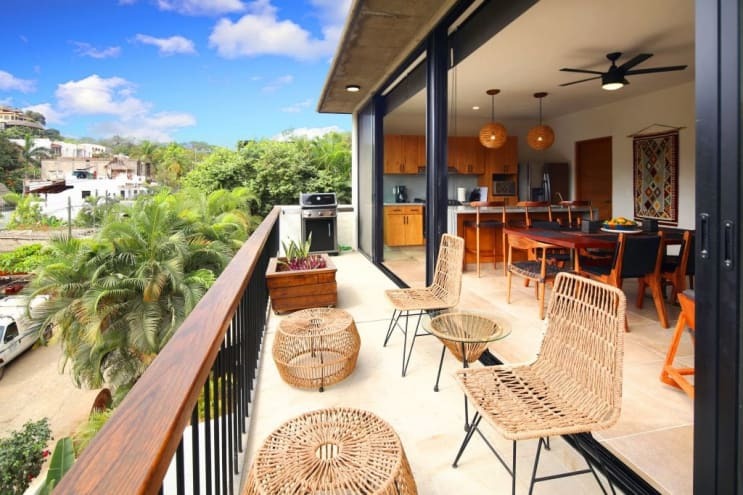 This brand new 3 bedroom, 3 bath vacation rental condo in the Casa Galeria complex is located in a clean and safe residential neighborhood a few blocks from the heart of town striking the perfect balance of privacy while still remaining central and distinctly Sayulita. An easy five minute walk allows you to explore all the wonderful Sayulita amenities such as the central beach and surfing, numerous restaurants and cafes, fresh local foods and the coolest of shopping boutiques. The location also provides a bonus for beachgoers as Playa De los Muertos and Playa Carricitos can be reached by foot offering the option of accessing a sheltered bay preferred by many locals or an even more secluded paradise beach experience. This beautiful two level condo includes a large rooftop terrace with jungle and village views, and includes seating perfect for lounging in the sun or shade. Take an afternoon siesta in a hammoc, roll out a yoga mat or sip a cocktail above the tree tops! The living room, dining room, and kitchen area open up to the expansive balcony, where you will find a BBQ grill and seating. There is also A/C in the main living space of this condo in addition to the bedrooms for your comfort. Enjoy a well equiped kitchen, washer and dryer and Wifi that even works well on the roof top terrace! The three bedrooms all have A/C and ceiling fans for your comfort. The master bedroom is on the second level, has a King size bed, TV, desk/workspace, and has access to the large rooftop terrace where you can enjoy morning coffee or yoga and lounge in the sun or shade. Full bathroom also on this level. There are two bedrooms on the main level, one has a Queen bed and ensuite bath, TV, desk/workspace. The third bedroom has two single beds (which can convert to one king), desk/workspace, TV, and a bathroom right outside the door. The Casa Galeria Complex consists of only 7 units, is gated and includes parking, which is a rare treat to find in Sayulita. The swimming pool, shared by the complex includes lounging space, and is a great place to swim laps! There are also restrooms with showers poolside for your convenience. Take advantage of a great local coffee shop that serves breakfast and lunch within the Casa Galeria, a great convenience if you are in need of your morning gourmet coffee or baked goods. For those new to Sayulita it is about 1 hour drive north of Puerto Vallarta airport, depending upon traffic. We are happy to suggest your options to travel to Sayulita. Aslo if you are traveling with a larger group and require more rooms please ask as we can get you in touch with friends that may be able to accomate you nearby. 4 night minimum stay. Casa Azure is spacious and lovely. Everything was spotless. A full service kitchen and dining room. The rooftop deck was especially stunning in the evenings when the stars were out. It is an easy walk to the beach and downtown. Three couples stayed a week at Casa Azure in January, 2019, and enjoyed everything about it!! It's new and has very comfortable, delightful furnishings, a gourmet kitchen, three very generous-sized bedrooms, three sparkling and modern bathrooms, and a large open deck off the upper bedroom! Our property managers, the Three Amigos, went way out of their way to welcome us, thoroughly explaining the house amenities when we arrived, and taking us on a golf cart tour of the town, pointing out the good meat shops, best margarita places, fine restaurants, produce shops, etc. Every other day Erica cleaned and polished up the place. Since the building is located close to downtown restaurants, etc., we walked quite a bit but used our golf cart to get to the Muertos beach and more distant shopping and eateries! We all would recommend the place very highly! Six stars out of five!!!! GO THROUGH SAYULITA LIFE TO RESERVE!!! We had a fantastic time staying at Casa Azure. The condo is brand new, clean, very spacious. The kitchen is well stocked and has a filtered drinking water faucet plus a water tower that dispenses both hot and cold drinking water. There are many extras like olive oil and food seasonings. Each room has a safe for storing valuables. Each bedroom has 2 beach towels inside a mesh beach bag so the sand falls through, a touch that I thought was really great. There is a key-less entry into Casa Azure as well as the condo complex from the street which means you don’t have to worry about carrying around a key. The location is great! It’s very close to the main plaza and main beach, yet the place is quiet. Everything is in close walking distance. Gabriel from the 3 Amigos Property Management Company checked us in and was an amazing host! He made us margaritas, gave us a lovely tour of heart the of Sayulita in his golf cart, pointing out many of his favorite places to eat. Throughout our stay he messaged us to ask how our stay was going and asked if we needed anything. They allowed us to have an early check in and late check out which was very nice! All in all, a fantastic experience! We would definitely like to go back to Casa Azure!! My wife, kids and I stayed at Casa Azure for a week. Everything is as expected and better. I don’t think we could have stayed in a better spot. The decor is very stylish. There was a cleaner that came in ever other day. A washing/dryer machine on site was nice considering everything is covered in sand at the end of the day. The patio upstairs was used every morning (yoga mats supplied) and every evening for relaxing. I need to figure out how to buy a place like this!! Thank you so much for letting us stay here. Modern, spotless and great location! Amazing vacation rental experience from all aspects! The place was outstanding, modern and spotless, location was incredible, and the local knowledge/hospitality was on another level. Highly recommended, will be back again. We really enjoyed our stay at Casa Azure. The location is peaceful and quiet yet it's just a few minutes walk to the center of town. The space itself is very clean and spacious, with a beautifully decorated interior. We especially enjoyed having the balcony and rooftop terrace as an extra place to lounge around. The hammocks and yoga mats were nice touches too. Although the beach is just a few minutes away, the pool was a great option, equipped with its own shower and bathroom, especially if you’re traveling with kids or don’t want to spend the entire day in the sand. Gabriel is a fantastic manager; he gave great suggestions on all things local (loved the arrival tour!). He was very responsive throughout our stay and flexible with our arrival/departure times which was very helpful. The turtle release was a highlight of our trip and we would not have known about it without Gabriel filling us in on the details, and even giving us a ride there. It was a truly magical experience! We'll definitely visit again and we recommend Casa Azure and Amigos while visiting Sayulita. 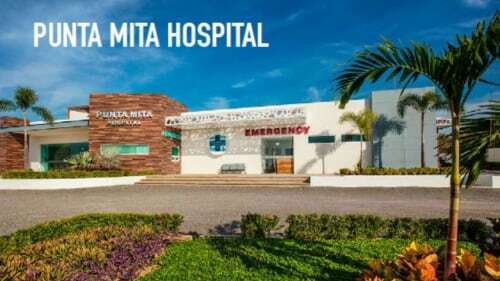 Simplemente lo mejor de lo mejor lo recomiendo amplíamente es mucho más lindo el lugar ya en persona no se arrepentirán. hermoso lugar - beautiful place! El departamento excelente, todo siempre limpio y la atención estuvo increíble! For your convenience and security, we accept PayPal and US Wire Transfers. Seasonal rates are per night and in US Dollars. Casa Azure sleeps up to 6 guests in 4 beds. 4 night minimum stay. 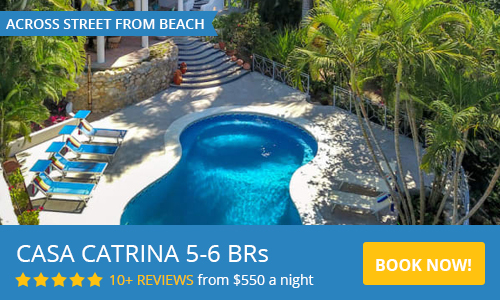 ****SPECIAL**** Holiday at the stunning Casa Azure for only $225 USD per night from 20 Jan unitl 20 May (special is exluding Semana Santa Holiday which is April 15-28 April). Lauretta first traveled to Sayulita area in 2011 and quickly fell head over heels in love with this magic town! The proximity to Sayulita beach, restaurants and all the cool shops makes it very walkable and ideal location to explore all! Make Casa Azure your home in Sayulita.